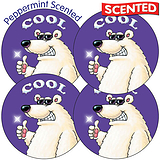 An A4 sheet of 35 stickers each with a diameter of 37mm in a peppermint fragrance. 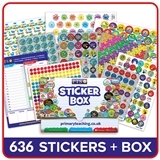 We have grown our range of scented stickers over the last 15 years to over 30. These multi sensory stickers have an encapsulated varnish which releases the fragrance when rubbed. It's the old scratch and sniff principle, but we didn't like the sound of that, here at PTS we prefer 'Rub and Smell'. Great for use on books and jumpers alike.